Apple on Tuesday pushed out watchOS 5.1, bringing bug fixes, iOS 12.1 compatibility -- but lacking an awaited ECG (electrocardiogram) app for Series 4 Apple Watches, as well as smaller changes for all compatible models. The update must be installed through the iPhone Watch app. An iPhone and Watch must also be within close range of each other, and the Watch must be on a charger and have at least 50 percent power. The update lacks ECG support which was a major selling point of the Series 4, but has not been included since the wearable first shipped on Sept. 21. The technology relies on electrodes built into the base and the digital crown, allowing it to operate like a single-lead ECG sensor. This can be used to detect signs of atrial fibrillation, though Watches like the Series 3 can still perform this to a lesser degree. Other changes are comparatively minor. The software supports Group FaceTime calls via audio, and some new watchface customization options. watchOS 5.1 is available on all Apple Watches except for the first-generation model. 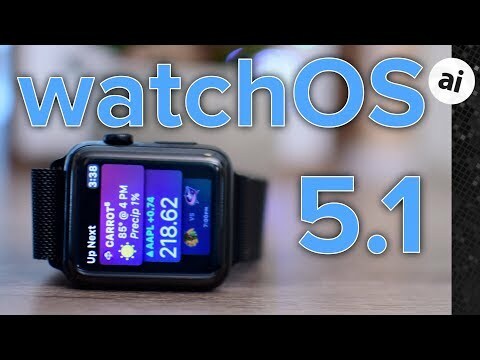 Update: ECG has not been enabled in the watchOS 5.1 update. AppleInsider regrets the error. Woo hoo! I can’t wait to get home and try it out!! Stupid question... will Watch 5.x run decent in a Series 1? That's what we get for relying on press releases, sometimes. Fixed. They’ll forget if you release it late. They won’t forget if you release it broken. Just curious how that error got spread. Bummer! I was all excited to give it a try and noticed it was not installed after I updated to 5.1. Well, I hope it comes in the near future. Is the update available in Canada - can’t seem to download it.